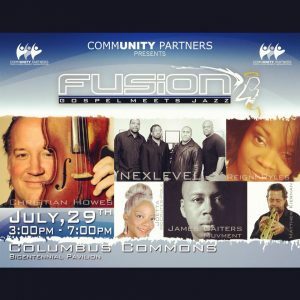 This Sunday, July 29th, join Community Partners for Fusion: a free Gospel Meets Jazz concert. This dynamic blending of two musical genres will excite and inspire. The show features performances by Christian Howes, NexLevel, Reigni Ryles, Joetta McCrutter-Polk, James Gaiters, and Matthew Kiernan. Blankets and lawn chairs are welcome. Coolers, food and non-alcoholic beverages are allowable but subject to inspection. Parking is available at the Columbus Commons Parking Garages – just steps away from the park.